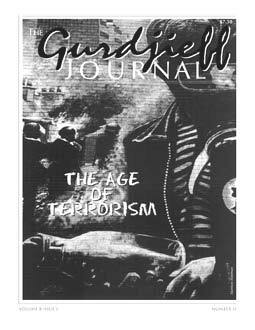 Explores Gurdjieff's perception of war, its origins and how to work with it. This photo essay and article gives a first-person account of life under terrorism. No one can doubt Gurdjieff's familiarity with and respect for Mohammed, Islam and Sufism. But does that make Gurdjieff a Sufi? Séances, Krishnamurti and Ramana Maharshi. A resume of reasons why students leave the Work. Adaptation is a mix of fact, fiction and fantasy in the mind of blocked screenwriter Charlie Kaufman. At the End of an Age by John Lukacs is a collection of five thematically related essays examining the relationship of Scientism to history. How neuroscience relates to Gurdjieff.